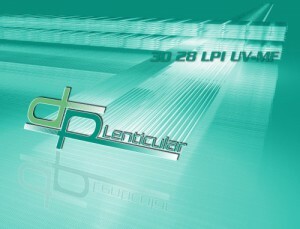 3D 28 LPI UV-MF™ lenticular sheet, specially designed for medium format 3D photography. in stock in Ireland and in Barcelona ! Considering that there was a gap between 3D 20 LPI UV-LF™ and 40 LPI VLF sheets so we decided to create this UNIQUE lens design, encouraged by some 3D photographers. The lens design is a 3D 28 LPI UV-MF™. Like our 3D 20 LPI UV-LF™, this 3D 28 LPI UV-MF™ lens has been designed with photographers for photographers ! – 3D as it’s designed for 3 dimensional images with a viewing angle of 37°, just like our 3D 20 LPI UV-LF™. – 28 LPI as this lens design does not exist anywhere in the World. – UV as it is produced in PETG-UV like the 3D 20 LPI UV-LF™ and the Motion 20 LPI UV-LF™. PETG-UV allows to use the product indoor and outdoor ! – MF for Medium Format as we recommend this lens for smaller image sizes like 1m or 1.2 meter high. – Like our 3D 20 LPI UV-LF™ and the Motion 20 LPI UV-LF™, this lens is produced in Europe. DPL’s 3D 28 LPI UV-MF™ is a 2.15 mm thick lenticular lens produced in 122 cm x 180 cm and available in many sizes, see below. This lens has a 37° viewing angle, making it very well suited for 3D lenticular applications printed on digital devices. This image has been created for us by Remy Verbanaz (www.myluxury3d.com). Interesting to keep in mind: the 3D 28 LPI UV-MF™ has been chosen because it displays exactly half the depth of our 3D 20 LPI UV-LF™. 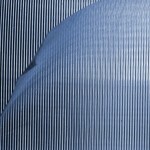 You will find the lenticular depth calculator here. This means that if you are perfectly satisfied with an A1 print on the 3D 28 LPI UV-MF™ material, you can print straightforward on the 3D 20 LPI UV-LF™ at twice the size (so 119 x 168 cm) and get exactly the same sharp/blurr balance. And of course, if you have a perfect 3D 20 LPI UV-LF™ print, you can print straightforward the same file at exactly half the size on the 3D 28 LPI UV-MF™. The material has been extruded with a specially developed UV protection resin to preserve colors when used in outdoor conditions such as bus shelters. The 3D 28 LPI UV-MF™ 122 cm x 180 cm sheets are packaged in boxes of 10 sheets and palletized with a 100 sheets and a maximum of 150 sheets (15 Boxes) per pallet. Available from DPLenticular’s warehouse and even from 1 sheet or smaller sheet sizes – see our small quantities Order here. Both sides of the product are protected with a transparent liner, don’t forget to pull it off carefully before use ! 122 x 180 cm = 48.03”x 70.9”(lenticules parallel to 180cm dimension), smaller sizes are available see below or our small quantities page. 122 x 160 cm = 48.03”x 62.99” (lenticules parallel to 160cm dimension), smaller sizes are available see below or our small quantities page. it can be laser-cut (unlike polycarbonate), for more information, see our FAQ page or contact us.